Drawing instruments are furnished at prices ranging from a few cents up to many dollars; your work will not demand a very expensive set, but it should contain at least the following tools of a very substantial quality. (See Figure 2.) One ruling pen. One steel spring bow pencil. One steel spring bow pen. One plane divider. Compasses with fixed needle point, pen and pencil points. Box of leads. 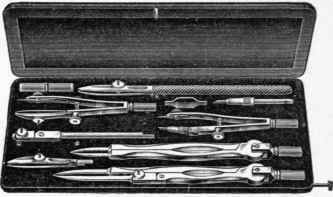 The other instruments sometimes found in the drawing set are very convenient but not absolutely necessary for your early work. A drawing board is simply a plain, smooth board with at least one absolutely straight edge. It should be made of some kind of soft wood which will easily receive the thumb tacks; either white pine or basswood is generally used. You should have two triangles, one 8-inch 45-degree (See Figure 4) and one 8-inch 30x60-degree (See Figure 5). 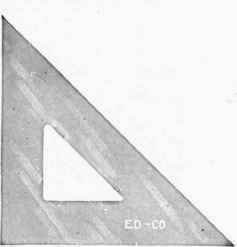 The triangles are to be used (resting on the top edge of the T-square, properly held) to draw all vertical and oblique lines. Triangles are made of various kinds of material, but the transparent ones will give best satisfaction. The ruler, or scale as it is usually called, is a triangular boxwood rule with the various fractional parts of an inch accurately marked. (See Figure 7.) An ordinary flat ruler may be used, but it is difficult to make absolutely accurate measurements with such a scale. You will observe that the inch marks do not continue to the extreme ends of the triangular scale; this is done to make sure that if the ends are damaged accurate measurements will not be hindered. 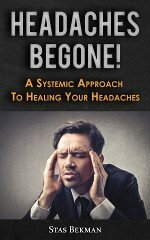 The scale is to be used only in making measurements; it should never be used in ruling lines. 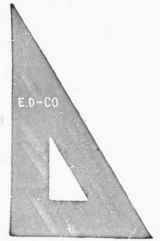 The irregular curve is used in drawing designs which employ curves that cannot be laid out with the compass. (See Figure 8.) It is not absolutely necessary, particularly in your early work, but it will be a great help in later work when you wish to lay out graceful designs.